We had to get up super early to make our flight to Ajaccio. Despite the concierge informing us that 1 hour in advance was plenty, after our experience of almost missing our flight in Chicago, we felt better being there well ahead of time. 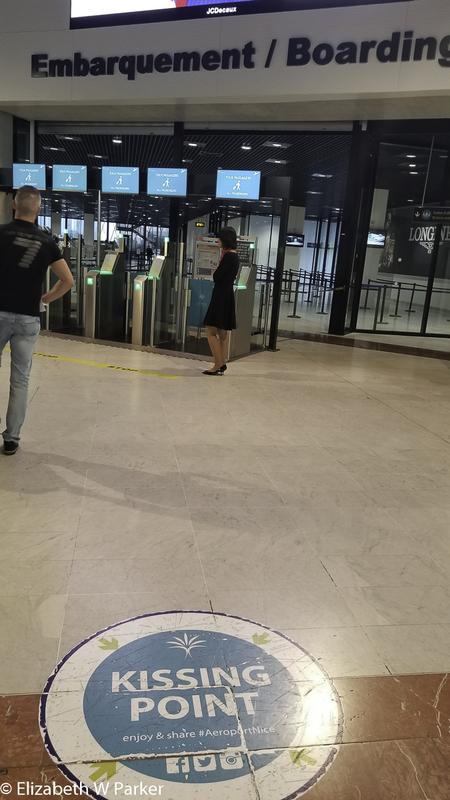 If you know how European airports work, then you know that we were at the airport for almost a hour before we were told at what gate to present ourselves. We located the correct gate, then took a little walk. By the time we returned, just like in the USA, the flight was already completely boarded before the announced boarding time. The flight was short, just 45 minutes, and uneventful. 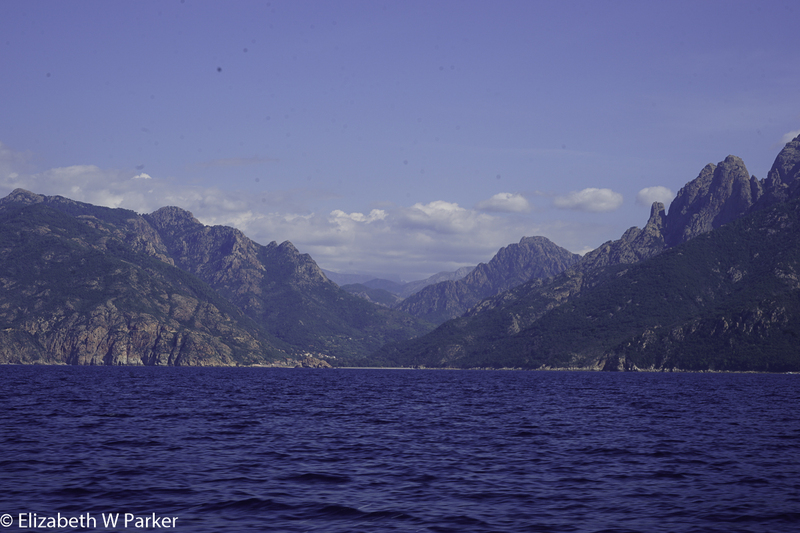 after reading various literary accounts of approaching Corsica and seeing the island appear magically from the ocean mist, I was glued to the window to try to duplicate that experience. It didn’t work. The sky was cloudy up where we were flying and we were so close to the island when we descended that the requisite mist was missing. So, here we are in Ajaccio, Corsica: First, let’s talk about how to pronounce Ajaccio. Gerry and I had a running argument about this until our Wilderness Travel guide sorted us out. Gerry insisted that the town name is pronounced ah-jahx-see-o, according to two French-speaking friends. I insisted (from where I do not remember- great way to insist!) it was ah-YAH-cho. We were both right! I love that! Gerry’s pronunciation is French; mine is Corsican. Second, let’s talk about Corsican – the language. Corsican is not a dialect of French or Italian. Corsican is a bona fide independent, romance language, with some similarities to the old Tuscan dialect of Italian. I would have thought it might be related to the old Genoese dialect of Italian, considering the influence of the Genoans here, but I learned that the Lombards (including the Pisans) were here on the island first. Corsican is actually spoken by more people in northern Sardinia (about 200,000) than in Corsica (about 125,000). Fortunately for us, French is spoken everywhere. 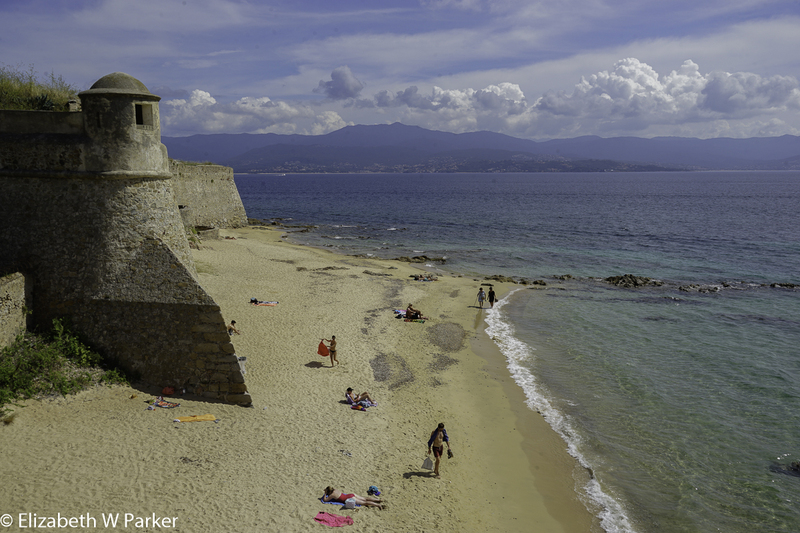 And, third, who cares about Ajaccio (however you say it)? Actually, Ajaccio is the capital of Corsica. 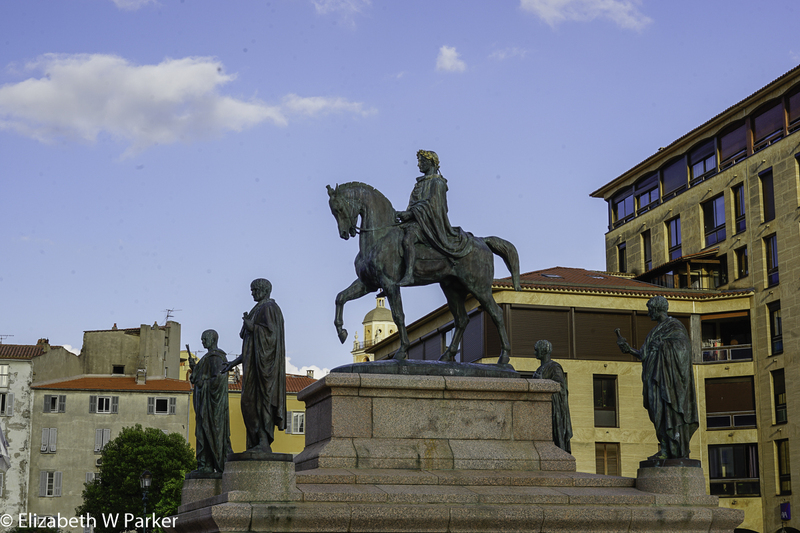 It isn’t the best known city of Corsica or the most visited, but it is the hometown of Napoleon, and the city gets quite a bit of mileage out of that connection. Even the airport is named for him. It is located on the west coast of Corsica and has a large ferry harbor. I had so wanted to get here by boat (like my literature pals), but that will be for the next visit. We started out our day by walking through the narrow streets between our hotel and the water. Our excuse was looking for the Tourist Information Office. We found it and had a nice chat with someone about things to do in two days. Taking a boat ride to see the coast is the “thing to do.” We asked about seeing the Iles Sanguinaires, which I assumed was the big attraction. (I was wrong as you will read below.) You can actually get to see them from the land by taking a public bus. However, our “orienter” in the Tourist Office suggested a real boat trip. We spent the remainder of that first morning walking around the Ciudadella, the port, the market, and the shopping streets. The town is not very big, so it is very walkable and everything is easy to find. 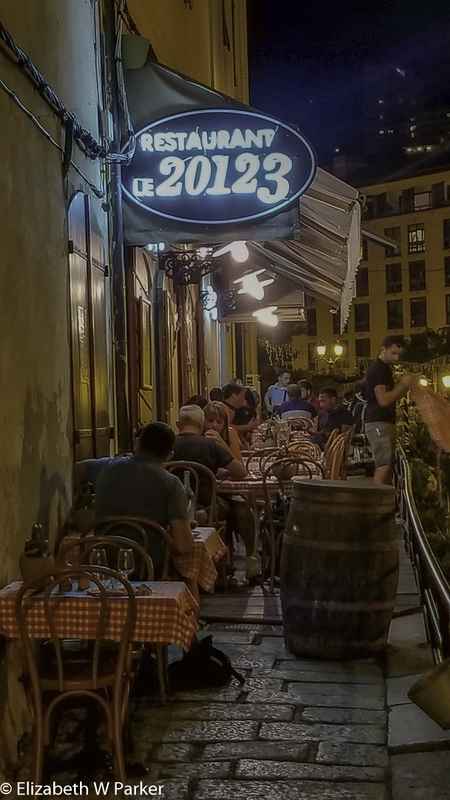 There are lots of narrow little streets, clogged with restaurant tables and awnings – everything feels very French! The vibe here is excellent. Actually, this feels like France felt to me back in 1974 when I made my first trip to Europe. Most people do not speak any English, so Gerry is using his newly-brushed up French, and I dust off the occasional word here and there, too. We had lunch at a restaurant called A Merendella Citadina in the old city of Ajaccio. We loved it! The most memorable dish was an Asparagus panna cotta. It wasn’t a desert; It was a starter. 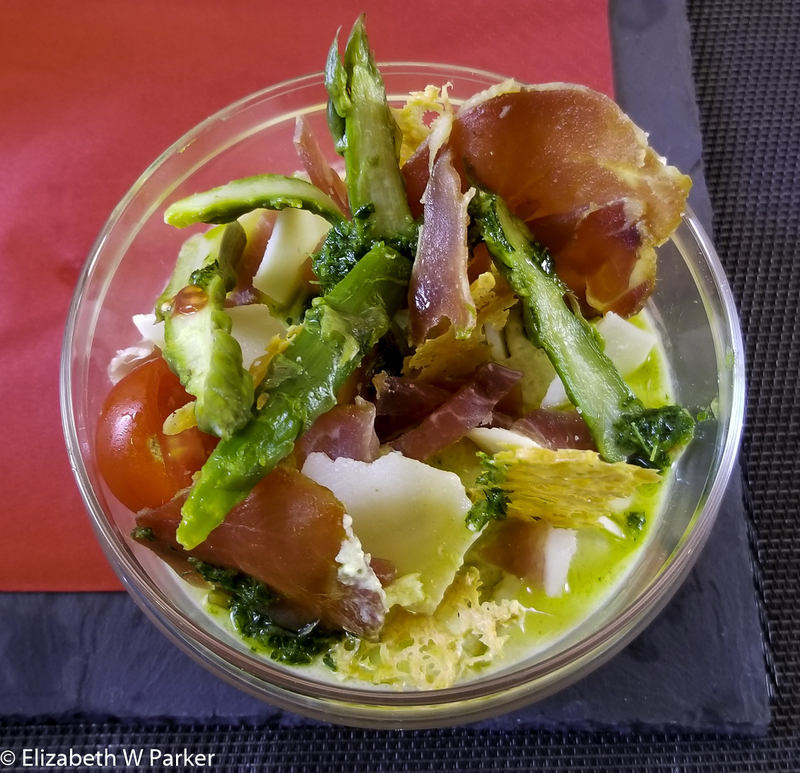 It was an asparagus custard with asparagus spears, crispy baked Parmesan cheese wafers, tomatoes and prosciutto on top. It tasted as good as it looked! 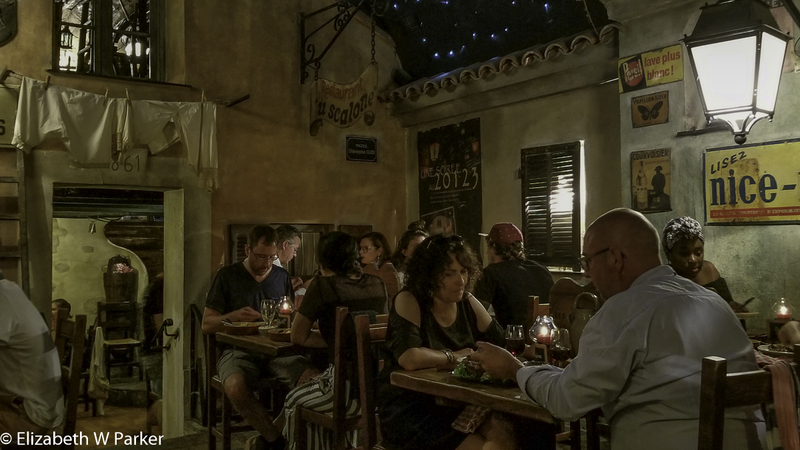 Once they, and we, had all finished resting, we headed back to the old city to a hopping outdoor bar on the Rue Roi du Rome (that’s a tongue-twister!) for a drink. It was a good place to catch-up and prepare for dinner. Once ready to eat we headed off in search of a vegetarian friendly place for dinner and ended up at the A Casa Leca. We had very good food – all of us chose the same dish! The staff was also very friendly and helpful. We had breakfast in the hotel this morning, then headed out for a walk through the market in Place Foch. There were locals, but the majority of the people were tourists. A huge cruise ship, Caribbean Cruises’ Navigator of the Seas, was docked in town this morning. We ran into groups throughout the day, but other than waiting a minute of two for a group to file through a narrow area, they really didn’t affect our day in the slightest. From the market we slipped across the street to the harbor and booked ourselves a boat trip for tomorrow. That should be fun! We are expecting beautiful scenery. We meandered about after that, looking at the boats in the harbor, little inflatables, fishing boats, yachts and finally the cruise ship. From the ridiculous to the sublime, or vice versa depending on your outlook! Back in the market we bought some fruit to take on tomorrow’s trip and some honey, a gift. The day is proving to be warm, despite a beautifully fresh cool start, so we headed to the Musée National de la Maison Bonaparte for a little touring inside. You may see the Maison billed as Napoleon’s home – and it was for a few years, until he was 9. Truly, it is the home of the Bonaparte family. They lived there when Napoleon (1st) was a child. Later, after the English were expelled from Corsica, Letizia, Napoleon’s mother, returned and remained in residence for the rest of her life. In the museum expect to learn a good deal about the Bonaparte family. I got straightened out on the various Napoleons (I, II, and III) and put some of my art history memories to work finally making some sense of the family tree. I had read that there is a love/hate relationship between Corsica and Napoleon. It is a mixed legacy as far as the island is concerned. There was also a period of cultish, hero worship of the man that kept visitors coming to the island, almost to pay homage. I felt some of that while in the house. Tourists, not really up on their history, were clambering to make this visit. I felt none of that but I do have a healthy dose of historical curiosity and so I found the maison to be quite interesting. 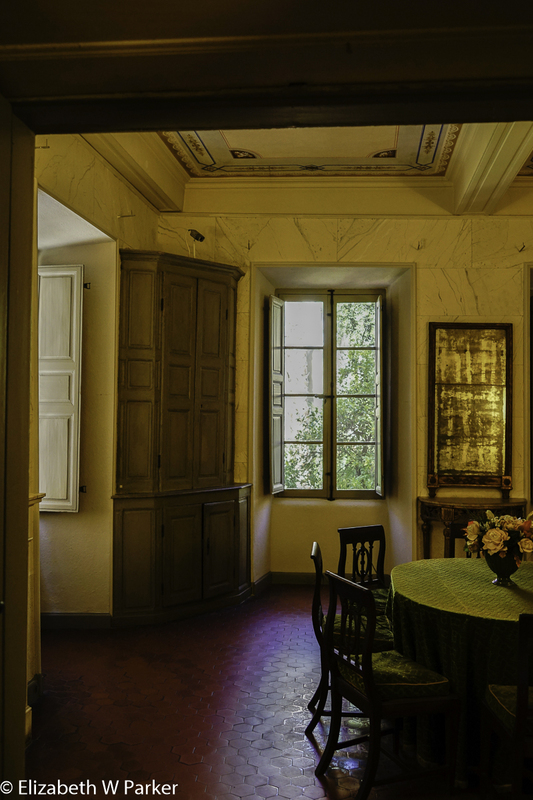 If the family history of the Bonapartes does not thrill you, you may enjoy seeing what an upper class Corsican home would have looked like in the 1700s and 1800s. The regally themed decor of Letizia’s rooms after the success of her son and grandsons is interesting, especially since all the furniture is just stashed in a couple of rooms and not set up as if a real family lived there. On the lowest level, you will also get to see old machinery for squeezing oil from olives and other materials for daily life tasks. We exited the museum and had lunch just a few steps away in the Rue Roi du Rome at a restaurant of the same name, Roi du Rome (the title of Napoleon #1’s son, Napoleon #2). We like to stick with a theme. One of the very nice things about Ajaccio is the paucity of English speakers in the service industry. Practicing French is no problem, and even someone who can just master Bon Jour, Merci and the extreme basics will experience the thrill of putting those words to frequent use. After lunch, we went to the Fesch Museum and to visit the Imperial Chapel which is the same palace complex. 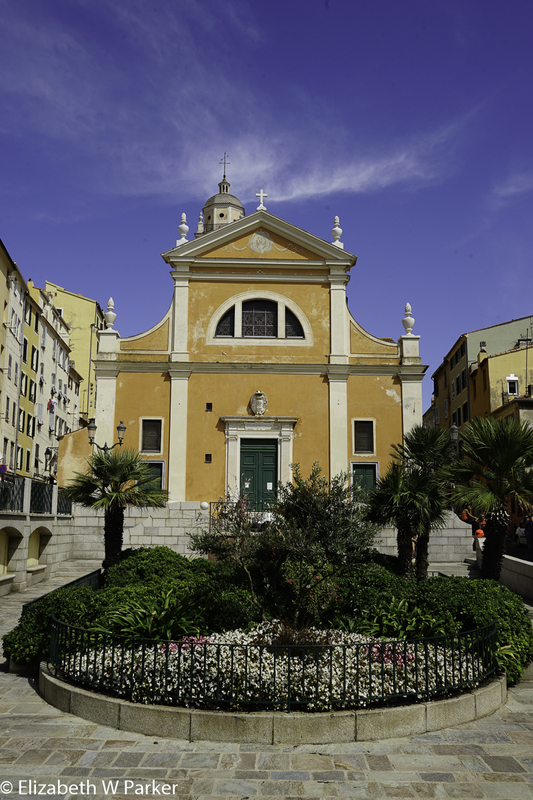 The chapel has a distinct Roman (as in Vatican) feel to it, not surprisingly, because Cardinal Joseph Fesch, a half-brother of Napoleon’s mother, spent years in that city. The chapel is the burial place of the various Bonaparte family members, Napoleon I is buried in Les Invalides in Paris in grandiose style. 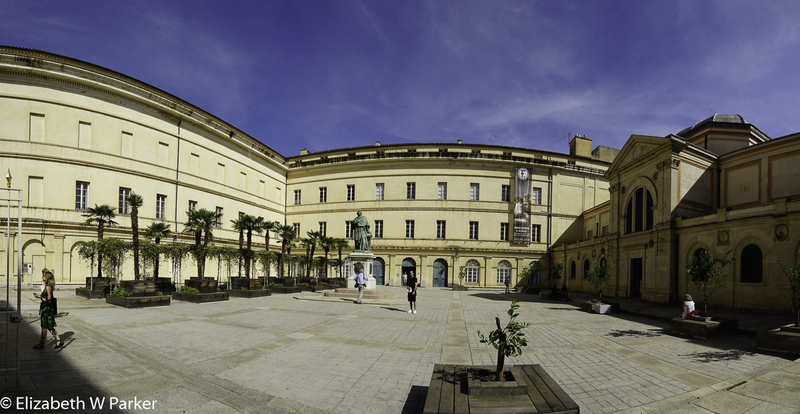 The palace however, is a wonderful museum of the cardinal’s collection of paintings. Most, I gathered, were purchased while he was in Rome. The reviews for the museum are very misleading. People who simply do not like art museums or who don’t like the style of the paintings give the place bad reviews. This is unfair. The museum has many high quality works. Not all are by artists I recognize, but the work is definitely good. That you don’t like that style of painting is beside the point. 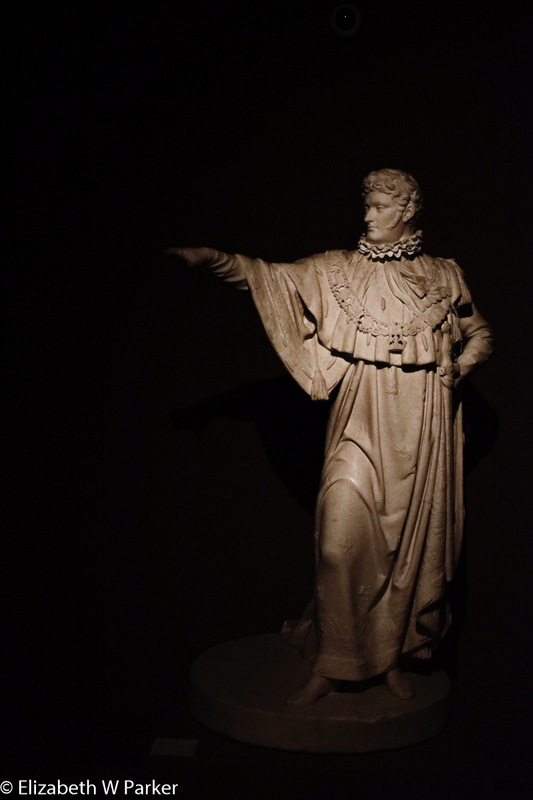 The museum is also arranged chronologically by the dates of the works themselves, so even an untrained eye looking carefully will see the way that art changed through the centuries. On the ground floor, (the third you visit, as the visit begins on the third and then moves downward) there is more Napoleon stuff, like busts and paintings of the Bonaparte family members. (Note: this section gets good reviews…per my comment above.) It would be great to have a family tree in hand as you peruse this part – the names are so similar it is hard to always know who you’re looking at! The family resemblance of all the members is quite striking. Leaving the museum and the chapel, we walked in search of a store that specializes in jewelry made from the stones native to Corsica, Les Pierres de Corse. I purchased a necklace and earrings set of “the eyes of St. Lucie” (a shell) with coral. I know that neither of those qualify as “stones.” I loved the shop, especially because the salesperson was the jeweler’s wife. He creates and she sells. I love that personal connection. We had a lovely and fun dinner at A Cantina di Ghjulia. The food was home-cooking Corsican: We had zucchini and zucchini flower fritters to start. Now there is something I haven’t eaten in 40 years – zucchini flower fritters! They were delicious! The service was lots of fun, all family and friends. Ghjulia the cook, is the mother, Dad welcomes guests on the patio, Andree, the daughter is the maitre’d and her best friend is the waitress/busgirl/ etc. Very nice dinner! You must make reservations! They have only one seating for dinner and the place is small. Definitely worth making the effort! Typical View along the coast – High watch towers guard against pirate attacks. We got up and out of the hotel early today because we were going on an 8 ½ hour boat ride to see the Iles Sanguinaires, les Calanches (Calanques) de Piana and the Scandola Nature Reserve, with a stop for lunch in Girolata. What a great day it was! It was beautiful weather. The sun was shining and it wasn’t terribly hot (lots of breeze on a boat, of course). 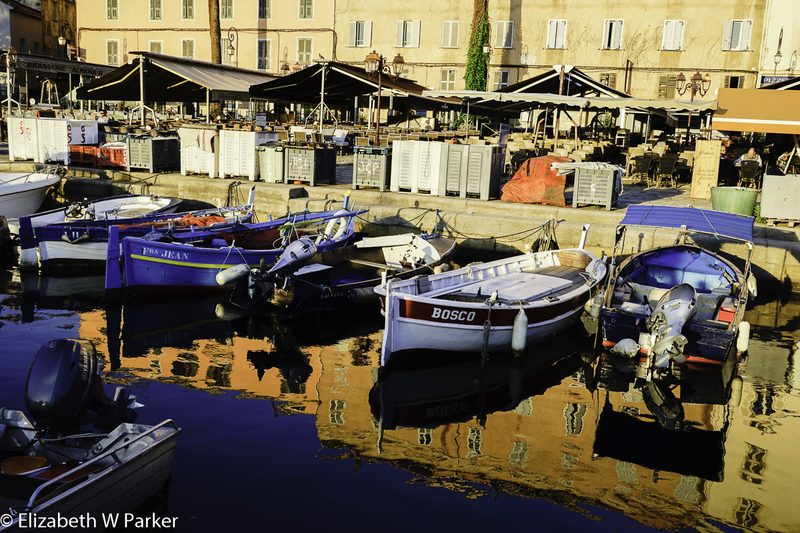 We were about 60 passengers – I think all spoke French except for us. French or no, the PA system was pretty hard to hear over the wind and the motor, I didn’t get far with the little I know but I think Gerry fared slightly better. There was a crew member, the engineer, who spoke perfect English and so gave us a private safety briefing and answered our questions during the trip. The star of the day was the scenery. From the morning mists to the afternoon shadows, we saw some of the most spectacular rocks I have ever seen. 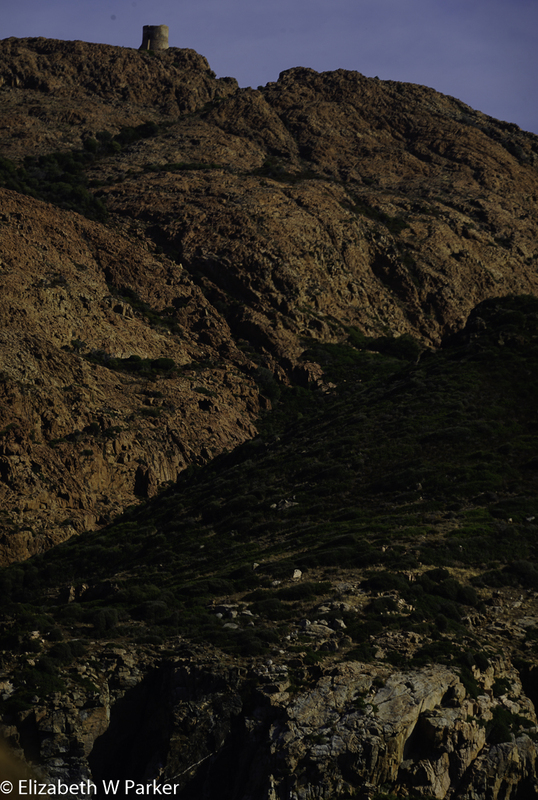 The Scandola Reserve was the most interesting – there were so many different colors and textures. We rode up the coast, passing the Iles Sanguinaires and the Calanques, and spent maybe 1½ hours floating around the Scandola rocks. Our captain got us in and out of tight spaces, so that despite the size of our boat, we did get to see the rocks from all angles. Everyone was able to see and take pictures. Then we stopped for lunch. We had started out at 8 so we were pretty hungry. The place where we stopped, Girolata, has several restaurants to choose from, and we chose the La Cabane du Berger. We all had pasta. Three had the lasagna, which was made with brocciu (the local fresh cheese) and spinach. I had linguini with scallops and parsley. We were all happy! But two and a half hours is a lot of time to kill even eating lunch and it was hot in the sun on the beach. The “town” was in a cove with a rocky, stony beach and lots of boats. Take note! If you go on this trip (which I insist you do if you visit Corsica) bear in mind that the two-hour visit to this little settlement is long enough to take a swim in the gorgeous water! So wear or bring a bathing suit and a towel. All four of us loved this boat trip, but we also agreed that when we do it again, we will take one of the smaller, faster boats, just so we can go in and out of the caves along the shore. Besides, those boats looked like a lot of fun! In 8 hours I can take a lot of pictures (574), so I hope the slideshow isn’t too long(only 30!). There is so much I want you to see – the variety, the colors, the drama of their creation, the drama of their setting. Here is a website that will impress upon you the enormous variety of rocks and structures that exist in Corsica, even if you cannot pronounce all the words. Looking at the map, I was also impressed by the ages of these rocks; They didn’t get like this all at the same time. It is amazing to me how the earth was formed and how old it is. It is also so “cool” that hot magma can cool into so many different shapes. The Iles Sanguinaires – the Bloody Islands, or the Bloodthirsty Islands or the Blood Islands – I saw it translated as all of these – actually get their name because they are made of pink granite and they glow in the sunset! We got back at about 6:30 pm. Cindy and Greg opted for a quick pizza, but Gerry and I went to The 20123 for dinner. This was an experience, too. The restaurant inside (and you should sit inside, even if outside is so inviting) is like a village. The ceiling is painted like a starry sky, and the the walls are painted to look like the outside walls of buildings in a town. There is a fountain where you take a pitcher from your table and fill it with water! The effect is quite convincing. 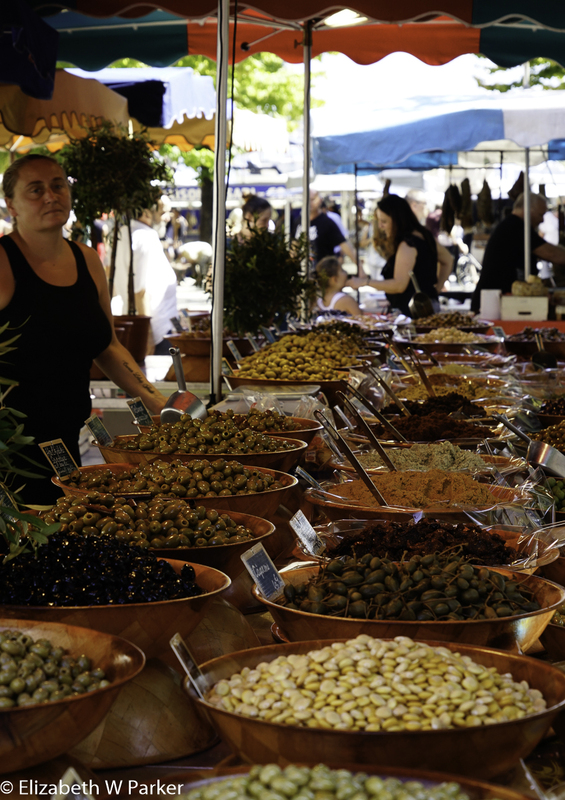 The food is local, down-home Corsican. No menus, prix fixe. You get a choice between two options for starter, entree and dessert. There is a charcuterie course between the starter and the entree. The food was abundant and tasty. Definitely try it. Tomorrow, we begin our hiking trip with Wilderness adventure. Come along…here we go.